The New York Pops is the largest independent pops orchestra in the United States, and the only professional symphonic orchestra in New York City specializing in popular music. Led by Music Director Steven Reineke, the orchestra performs an annual subscription series at Carnegie Hall, enjoying one of their highest subscription renewal rates. The New York Pops’ annual birthday gala is celebrated each spring, raising funds for the orchestra and its education programs. The New York Pops performs an annual series at its summer home, Forest Hills Stadium in Queens, NY, reaching audiences of more than 7,500. Now in its 36th season, The New York Pops celebrates the diversity of popular music’s evolving songbook. Every concert is a unique experience, with influences ranging from Broadway melodies to film scores, jazz, rock, pop and everything in between. 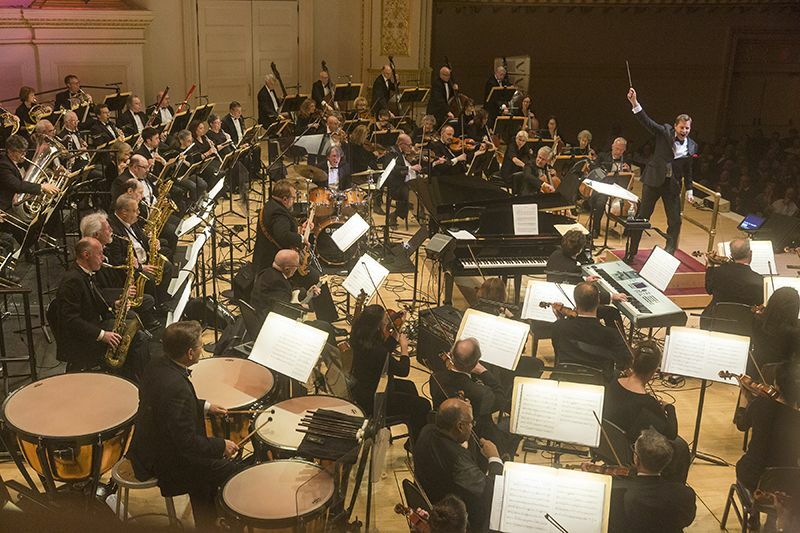 Under the leadership of dynamic Music Director and Conductor Steven Reineke, The New York Pops continues to re-imagine orchestral pops music. The New York Pops is dedicated to lifelong learning, and collaborates with public schools, community organizations, children’s hospitals and senior centers throughout the five boroughs of New York City. PopsEd allows thousands of New Yorkers of all ages and backgrounds to participate in fully customizable music programs that blend traditional education with pure fun. The New York Pops is committed to creating access for all members of the community. Thousands of children and their parents have the opportunity to see the orchestra during interactive and educational family concerts in partnership with Carnegie Hall’s Weill Music Institute. The New York Pops is a non-profit organization supported solely through the generosity of individual donations, institutional grants, corporate sponsorships and concert income. Steven Reineke is the Music Director of The New York Pops at Carnegie Hall, Principal Pops Conductor of the National Symphony Orchestra at the John F. Kennedy Center for the Performing Arts, and Principal Pops Conductor of the Houston Symphony and Toronto Symphony Orchestra. He previously held the posts of Principal Pops Conductor of the Long Beach and Modesto Symphony Orchestras and Associate Conductor of the Cincinnati Pops Orchestra. Mr. Reineke is a frequent guest conductor with The Philadelphia Orchestra and has been on the podium with the Boston Pops, The Cleveland Orchestra and the Chicago Symphony Orchestra at Ravinia. His extensive North American conducting appearances include Seattle, Edmonton and Pittsburgh. On stage, Mr. Reineke has created programs and collaborated with a range of leading artists from the worlds of hip hop, Broadway, television, and rock including: Common, Kendrick Lamar, Nas, Sutton Foster, Megan Hilty, Cheyenne Jackson, Wayne Brady, Peter Frampton, and Ben Folds, amongst others. In 2017 he was featured on National Public Radio's "All Things Considered" leading the National Symphony Orchestra - in a first for the show's 45-year history - performing live music excerpts in between news segments. As the creator of more than one hundred orchestral arrangements for the Cincinnati Pops Orchestra, Mr. Reineke’s work has been performed worldwide, and can be heard on numerous Cincinnati Pops Orchestra recordings on the Telarc label. His symphonic works Celebration Fanfare, Legend of Sleepy Hollow, and Casey at the Bat are performed frequently in North America. His numerous wind ensemble compositions are published by the C.L. Barnhouse Company and are performed by concert bands around the world. A native of Ohio, Mr. Reineke is a graduate of Miami University of Ohio, where he earned bachelor of music degrees with honors in both trumpet performance and music composition. Where do I buy tickets for The New York Pops concerts? Tickets are available on Carnegie Hall’s website beginning each season in August. The Box office is located at Carnegie Hall (corner of 57th Street and Seventh Avenue). Tickets can also be purchased through CarnegieCharge by calling 212-247-7800. Tickets to The New York Pops Birthday Gala become available in January through The New York Pops office. What should I expect at a New York Pops concert? How should I dress? Learn more about the Carnegie Hall concert experience, including what to wear, here. New York Pops concerts are loads of fun, and you can expect to laugh and smile. Most New York Pops concerts last 110-120 minutes, including one intermission. Do I qualify for a discounted ticket? Visit Carnegie Hall’s discount ticket page for a list of all reduced-rate ticket programs. How do I get to Carnegie Hall? Where is Forest Hills Stadium? Carnegie Hall is located in midtown Manhattan, at the corner of 57th Street and Seventh Avenue. It is easily accessible by subway, bus, or car. More information can be found here. Forest Hills Stadium is located in Queens, on the grounds of the West Side Tennis Club. For information on getting to the venue, click here. Who is Steven Reineke’s favorite singer? Ella Fitzgerald is Steven’s all-time favorite singer. Who were the first “stars” to appear with The New York Pops? Opera legend Roberta Peters appeared with The New York Pops in January 1984. “Throughout the evening, [Skitch] Henderson conducted with effusion. Time will tell whether the New York Pops can grow to become a mainstay in Manhattan's musical community. But Mr. Henderson's determination, and the enthusiasm of his forces, augur well for the young orchestra.” – Tim Page, The New York Times, January 22, 1984. Interested candidates should submit resume and cover letter in PDF format to jobs@nypops.org. Please no phone calls or materials by mail. We will only contact applicants we intend to interview.